The Jam's 1978 song 'Down at the Tubestation at Midnight' is about sadness and violence in the gritty subterranean night, but nowadays that time, when the tube's last half hour begins, is bright and busy. As 2015 slides towards winter, we're still waiting for the promised 24-hour tube, to be rolled in at the unions' pleasure and not before. In the meantime, the London Transport Museum have a new exhibition called Night Shift, charting over century of the capital's nocturnal public transport. There's selected facts and photos, and what is probably London Transport's second-best product, after transit: posters and graphic design. This exhibition starts with the period when electricity transformed everything. Victorians had introduced it, and by Edwardian times, night trams (horse-drawn since 1899) were electrified and West End theatres plugged in. 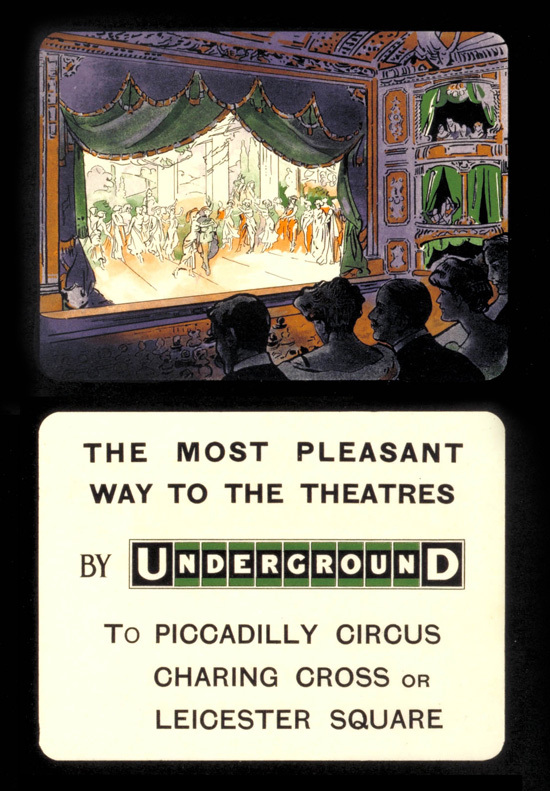 The Underground Electric Railways Company was keen to attract theatre-goers to their new (electric) deep-level tubes, which served them. The 1909 poster 'The Most Pleasant Way To the Theatres' (artist unknown) captures an atmosphere of most respectable ladies and gentlemen beguiled by a stage ablaze with electric light. The First World War curbed pub hours and night buses ceased, but Theatreland did carry on. The show misses this, and a chance to illustrate it with the madly mischievous Theatreland map (1915) commissioned by London Transport (and available in the museum's shop as well as glimpsed in the linked article) by the great graphic artist McDonald Gill (brother of Eric Gill). In fact, Gill is twice-slighted by Night Shift. 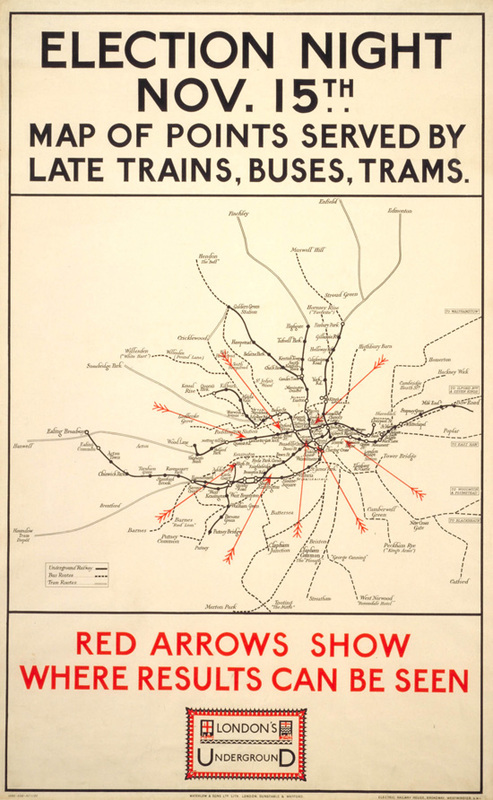 His new 1922 tube map, in use until Harry Beck's 1931 celebrated redesign, was adapted that same year (with tram lines added) to show where late-night early General Election results could be seen, indicated by whacking great arrows, as if Central London were Saint Sebastian tied to a tree. The arrows were likely added by Gill, the map is certainly his, but the poster in Night Shift appears as 'artist unknown'. The Roaring Twenties are better remembered as the time of flappers and the intoxicating new rhythms of the Jazz Age, and the Charleston was all the rage. 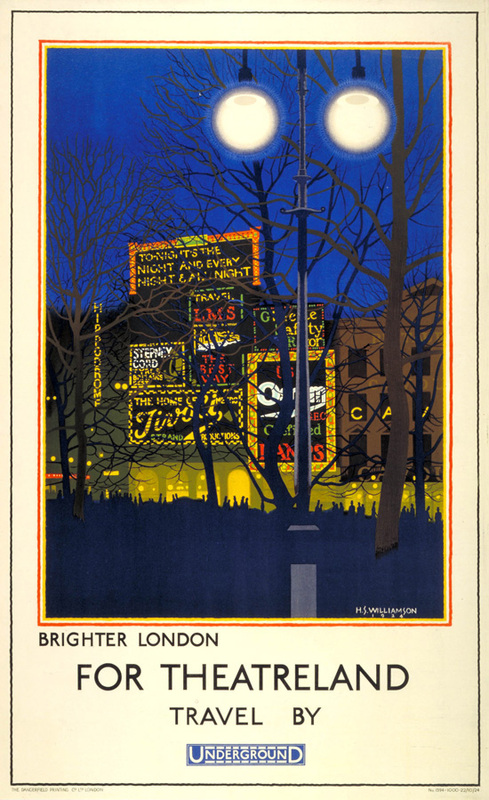 Although cinema was displacing theatre as the prime public entertainment, and despite London's giddy night scene, Night Shift's best poster from the time is quite serene- Harold Sandys' vivid Brighter London for Theatreland poster (1929). Architecture, too, was changing, and London Transport's leading architect Charles Holden had designed their monumental 55 Broadway headquarters and a new Piccadilly Circus station, embracing art deco, in the late 1920s. His stations on the Piccadilly Line extensions of the early 30s are not only stunningly modernistic, but incorporate light itself as a key element in their composition. 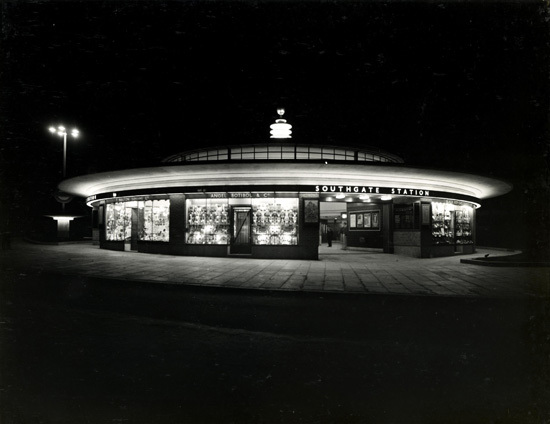 The exhibition includes a photo of the positively Flash Gordon-esque Southgate station in a 1933 night. The use of deep-level tube stations as public shelters in the Second World War is shown. We also see the first 'night owl' graphics from London Transport in 1943. After the war (and apart from the Coronation night), it took a long time for London to fully animate again. 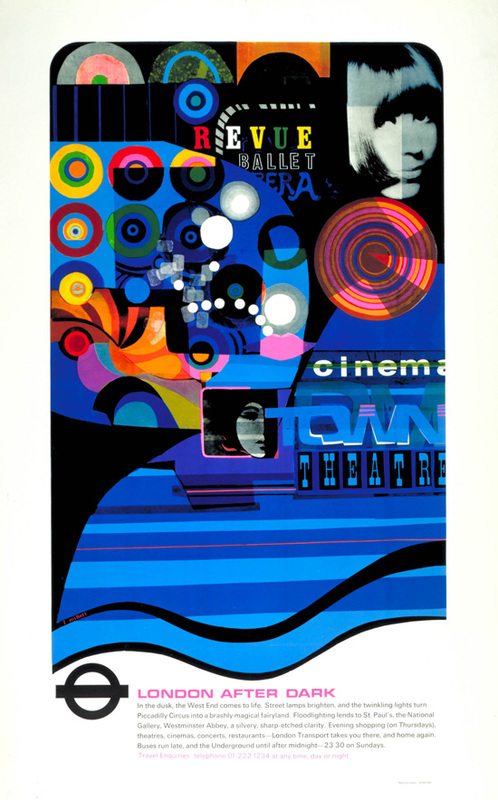 In the Swinging Sixties, London found itself the grooviest city on the planet, and Fred Millett's 1968 pop-art poster London After Dark captures something of it. But despite now-legendary bands playing dingy downstairs venues and the pop aristocracy hanging out in Soho or Chelsea clubs, the poster doesn't reference London's far-out, happening music scene (the word 'concerts' is there). It would be some time before the night music would create a passenger tsunami. In the 1990s, London had a third rush hour. Night buses would rapidly get so crowded in Camden after 2am, or 3am in the West End, you'd be lucky to get a seat. The bus stairs were choca with all manner of people sitting and standing on them. Unlike the morning and evening rush hours, no-one wore a suit- these were the clubbers, many of them 'completely off their face'. It happened when their clubs got out. London Transport had noticed the trend emerging a decade earlier, and called such passengers 'the disco crowd'. The current 'disco crowd' and everyone else has surged further - Transport for London report that night bus usage is up 173 per cent since 2000. Revellers will soon being going underground, mixing with night workers from cleaners to traders, and assorted folk from post-last-orders drinkers to travellers with crack-of-dawn flights. The 24-hour tube will change London, just as avery new ticket to ride always has - as curator Veronica Dominiak says, 'transport services have reshaped London and stimulated nightlife'. What this show touches on too lightly is how London's night scene reflected social changes. For example, Edwardian working-class music hall audiences were not lured by transport poster campaigns while a bourgeoise theatre audience was. We don't see the 'disco crowd', whether fab 60s girls in miniskirts or spaced ravers stumbling out into the dawn. We see mid-century photos of the tube's nocturnal rat-catchers and fluffers (women who cleaned the tunnels), but nothing of the hi-vis clad army of maintenance workers that nowadays gather outside stations nightly waiting to descend to their work. As for the Night Tube, there's nothing of the new shades-of-blue tube map and its expansive statement 'Free the Night'. 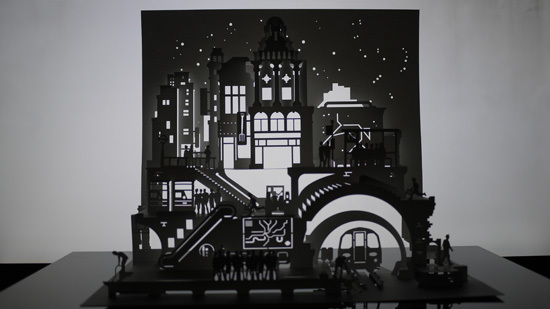 What's on show is a cut-paper artwork to mark it by Paper Dandy (Marc Hagan-Guiry), The Curious Night Shift, a collaboration with the National Theatre. It exquisitely depicts with back-lighting a scene from tube platform level (including a wall-map) to the starry sky above. What Night Shift needed was double the space, but what it has squeezed in is nevertheless a dream sequence of design, and at least a sample of a century of the city of night's life itself.